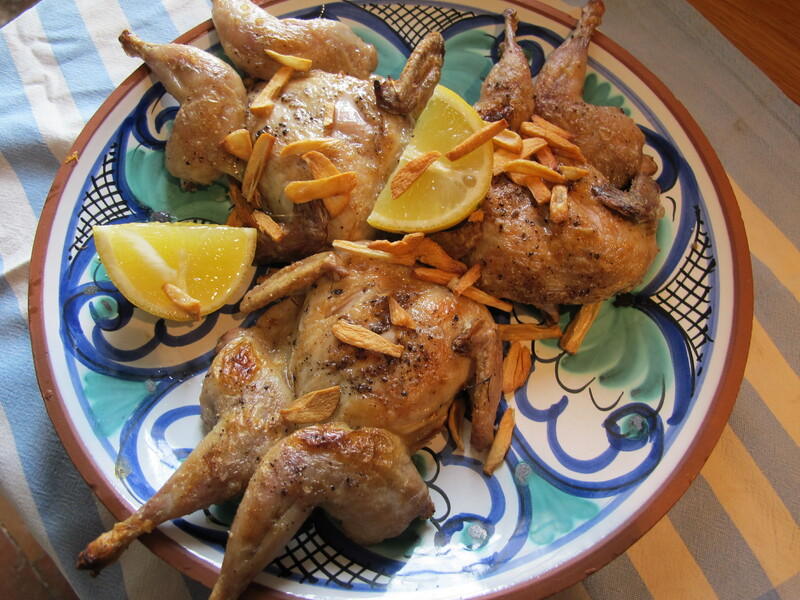 Quail are readily available here and increasingly so elsewhere I am hearing. There’s a light gaminess about them, making a change from chicken and guinea fowl. 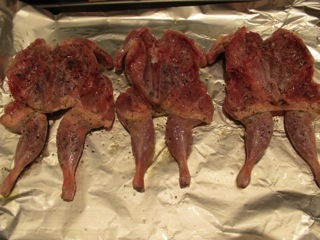 There are as many ways to cook a quail as skin a cat–what have I said!! You can marinade them or stuff them with countless variations of flavors. These mostly take some forethought and time. This way is simpler and quicker. I do have to snip off their heads here, which used to give me pause. In London I know they are sold headless. 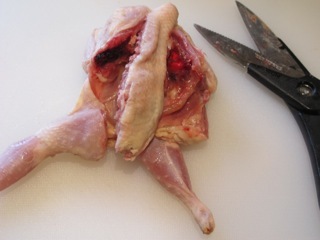 To spatchcock or spattlecock or butterfly is to remove the backbone of the bird in order to open it up and flattened it out–as you might do a book. This allows the bird to cook more quickly and evenly under the grill. Spatchcocking is an easy and oddly satisfying technique. All you need is a pair of poultry shears or strong scissors and the nerve to try it! 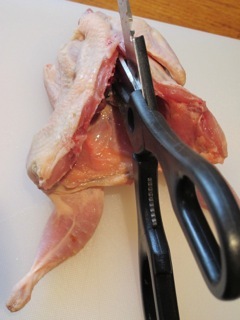 Hold the quail breast down and cut along each side of the backbone and lift it out. press apart the resulting gap to flatten the bird. Snip away any bits of fat and gristle still attached to the carcass. rinse the birds thoroughly and pat dry. Gently sauté the garlic in the oil until it starts to change color. Lift it out with a slotted spoon onto some kitchen paper [paper toweling]. Do the same with the sage leaves. Let the oil cool down. 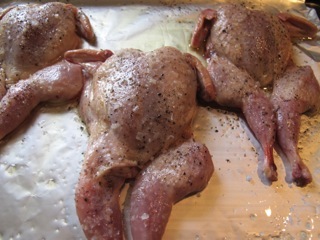 One by one, lift the quail by the legs and pass both sides through the oil coating them lightly. Let any surplus oil drip back into the pan before repeating the process. Place them on a shallow oven tray and slide them under the grill. Cook them about seven minutes each side–depending on their girth. A little crispiness won’t go amiss. 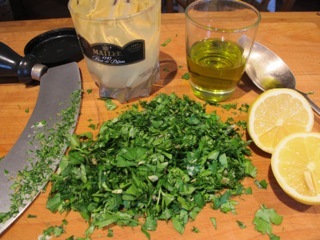 Sprinkle with garlic bits, sage (if you’ve used it–I didn’t in this case) and serve with a quartered lemon. Serve with the green sauce below (optional! 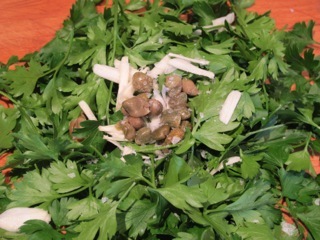 )–a simplified winter version (when many herbs are hard to come by) of the green sauce in Delicious Dishes for Diabetics. Make a pile of the first five ingredients. Put this reduced pile in a bowl and add the lemon juice and stir in the mustard. Add the olive oil mixing everything thoroughly. 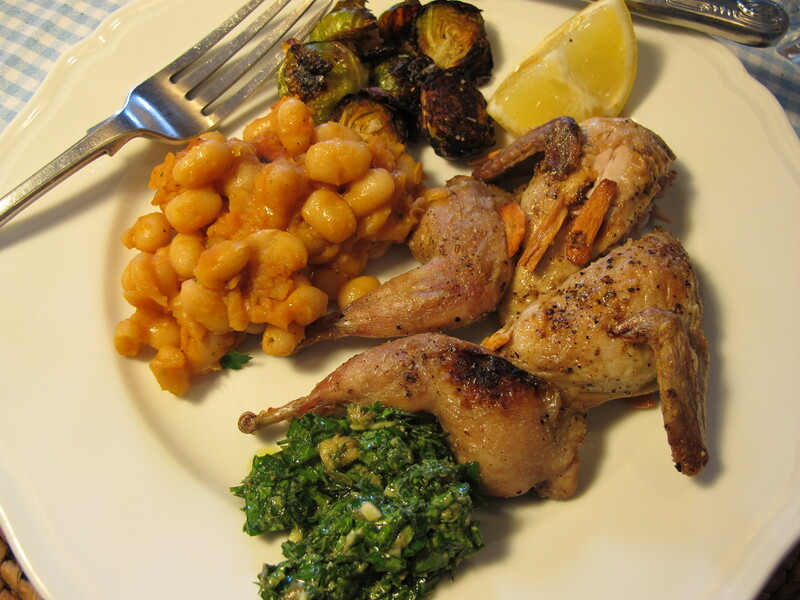 We ate the quail for lunch with the no-lunch-is-really-lunch-without-them blackened brussel sprouts! These little birds look good. I love the picture of them on the serving dish; one looks very modest with its knees together! I must try cooking quail – a good choice for one I’m guessing. Have you any interesting ways with celariac, Robin? Looks good, We would have to use Cornish hens or Chicken and your Green sauce is very close to what we call pesto sauce, Green sauce is more like a green chili sauce. Will let you know how it comes out soon. So nice to see wild game recipes that are healthy refreshing and new to me. I live in a region where I grew up on quail, pheasant, geese, and venison which in themselves are not unhealthy. However so often meats were prepared floured and fried with gravy or some other unhealthy way. I resorted to fish and chicken thinking I could not love wild game anymore! BRAVO! You really make wonderful dishes!